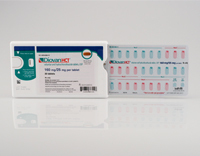 Contract packed by Anderson Packaging, Inc. on behalf of Novartis Pharmaceuticals, the Diovan HCT® Shellpak™ features 30 days of treatment in a calendarized unit dose blister format. To facilitate compliance with the medication regimen, tablets are laid out with color coded days and weeks, including reminders for refilling the prescription. The 30 day blister is contained in the 170mm Shellpak™ outer, a patented child resistant package design from MeadWestvaco. The rigid plastic design features a front and back label. The back label provides the designated area for the patient’s prescription label as well as an adhered prescription insert. 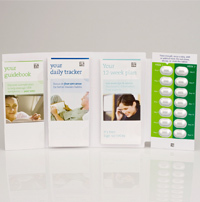 The front of the pack features an extended content booklet label, including a photograph of the pill. Multiple pages within the front label provide patients assistance with dosing instructions, guides to joining the BP Success Zone Program including both the website and toll-free number, and additional regulatory information. For more information, please contact the HCPC. Launched in October of 2009, the Pfizer Toviaz Physician Sample is indicated for the treatment of overactive bladder. The package utilizes the AmerisourceBergen Packaging Group IntuiDose ™ child resistant, compliance prompting design. The design has passed CPSC Child Resistant/Senior Friendly unit dose testing, garnering an F-1 rating and receiving very favorable scores for Senior dispensability. The four panel Toviaz wallet design provides a comprehensive approach to initializing overactive bladder therapy, utilizing a compliance prompting package design integrated with extensive tools for patient education, tips and tools for a detailed treatment plan, and tools to facilitate patient-doctor interaction for managing symptoms. The four panel folder format incorporates a patient guidebook complete with symptoms explanations, recommendations for managing OAB, how to properly take medication, and ways to enroll in interactive programs. The package includes a daily tracker, functioning as a guide and diary to track goals and health improvement. The program also provides a tool to review progress with the physician over the 12 week course of treatment. A customer response card is integrated in the pack, allowing patients to complete a questionnaire and enroll in an interactive treatment program to ensure success. Finally, the pack includes full patient prescribing information. Tablets are laid out in a simplified 14 day regiment, including instructions about how to properly ingest the medication. The IntuiDose package features a novel approach to providing the highest levels of child resistance while at the same time making the product easily accessible to adults. The simplified push-through design focuses on providing a consumer friendly solution to medication management. The use of a unit-dose compliance prompting package facilitates medication adherence and effectiveness of treatment, guiding patients to fill their prescription and maintain compliance over the course of treatment. 2008 CPY Innovative Design prize was awarded to CIAB – Compliance In a Bottle by Anderson Packaging, Inc. and AmerisourceBergen Packaging Group. The package is highly portable as well as extremely sturdy, making it convenient for taking along on a daily or longer-term basis. The broad surfaces allow for tremendous branding opportunities as well as labeling. Brand distinction is also increased through customization of the bottle color, size and label design, each of which are customizable. Opening the package is a simple, push-down-and-slide motion to remove the cap. 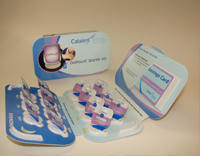 Consumers can then pull the blister card out for ease of dispensing. Because the child resistance is provided by the outer package, the burst strength necessary to compromise the pill cavity is minimized, providing additional senior friendliness. Contract packaged by Anderson Packaging for Somaxon Pharmaceuticals, Inc., the Silenor® Patient Starter Kit features a novel carton design that when opened resembles a bedroom complete with bed and nightstand. Contained within the design is a seven count unit dose carded blister, removable from the design to enable portability and convenience. 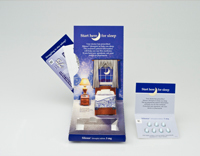 To support patient compliance and adherence, the bed carton design contains a literature pocket, housing the medication guide, the Sleep-Saver™ Program prescription discount card, and a multi-panel color leaflet complete with instructions on taking Silenor®, description of side effects, guides to enrolling in the Sleep-Saver™ program including website and toll free number, as well as additional information on insomnia treatment. The 2009 First Runner Up Compliance Package of the Year, BMS’ Onglyza Physician Sample was contract packed by Anderson Packaging. 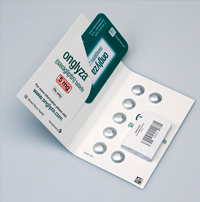 Receiving FDA approval in July of 2009, Onglyza™ is indicated for the treatment of type-2 diabetes. The two panel Physician Sample folder design utilizes a coldformed “foil-foil” unit dose blister design sealed into a carded blister. Patient prescribing information is integrated into the package at the point of dispensing. A pocket is included in the design to facilitate compliance supporting literature, allowing for placement of wallet reminder card that directs patients to the drug website or toll-free number for further information about treatment and potential savings when filling their script. The 2010 Compliance Package of the Year Second Runner Up package is Three Rivers Pharmaceutical’s Ribasphere® Ribapak for Ribavirin Tablets. Medical literature indicates that adherence to ribavirin therapy is correlated with improved sustained viral response and reduced risk of relapse in the treatment of adults with chronic Hepatitis C. Ribasphere® (ribavirin, USP) RibaPak® is the only form of ribavirin available in a daily, two-pill compliance package designed to enhance therapy adherence (see package insert for full prescribing information, including WARNINGS, ADVERSE REACTIONS, and DOSAGE AND ADMINISTRATION information). With Ribasphere® RibaPak®, you take only two ribavirin pills each day-one in the morning and one at night – instead of up to six, greatly reducing the number of ribavirin pills taken over 24 or 48 weeks of treatment. RibaPak® packaging is clearly marked for seven days of AM and PM dosing, and the completion of a compliance pack reminds the patient to administer their accompanying weekly interferon therapy. Through clearly marked packaging and a reduced pill burden, Ribasphere® RibaPak® is the only ribavirin pack designed and formulated to help the patient adhere to his or her treatment. The product was packaged in Three Rivers’ Ribapak by Sharp Corporation. Receiving FDA approval in May of 2009, the GlaxoSmithKline Lamictal® ODT™ Patient Titration Kit was made available commercially for the treatment of epilepsy as well as for bipolar disorder. The compliance prompting and child resistant format, contract packed by Anderson Packaging, Inc., of GSK’s Lamictal ODT medication utilizes a hybrid of the MWV Dosepak ™ design, with a unique construction to allow for the needs of delicate tabletsThe design has passed CPSC Child Resistant/Senior Friendly unit dose testing, garnering an F-4 rating. 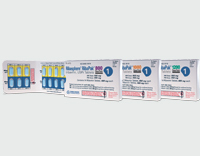 The Lamictal® Patient Titration Kit is part of a family of Lamictal® products. Individual therapies are distinguished by package color schemes, including Orange, Green, and Blue, with three titration therapies as well as four maintenance therapies. The Orange therapy includes a titration of the following strengths; 25mg, 50mg, and 100mg tablets in a 5 week regimen. Weeks of therapy are distinguished with concise graphics and patient dosing instruction, divided by individual peelable blister units contained within the package. Opening instructions with pictorial diagrams instruct patients on how to access tablets and ingest the product. Also prominently highlighted on the package are warnings about other drug interactions. Coartem® dispersible tablets from Novartis Especially designed to promote and help compliance in malaria treatment. Packaging enhances the dialogue between healthcare provider and patient. Pictorial and colour coded packs explain not only how but also why to be compliant with the 3-day course of therapy; Decreasing parasite count following each dose. Thanks to a unique public-private agreement with WHO Novartis makes Coartem available at cost. The Champix/Chantix wallet packaging portfolio is an answer to the question how to enhance compliance for products marketed on a global scale by customized packaging solutions. It provides a multi-dimensional solution for the essential product medication scheme, regional packaging requirements but also important prescription and reimbursement regulations. Titration dose (day 1-3 0,5 mg once a day, day 4-7 0,5 mg twice a day, continuing weeks 1 mg twice daily for a total of 12 weeks). Now with a new and improved design, Dosepak® is our original adherence-enhancing, paperboard package, designed to provide a substantial area for patient information while simplifying complex regimens with a printable calendarized blister for dosing therapy. The new and improved design increases sustainability by using less paperboard and reducing waste (savings significant, but vary depending upon package size), while maintaining the space for direct to patient communications and child resistance for the American market. The process improvements achieved with the new design also enable a lower cost with the same top quality features. There are over 35 commercialized applications with Dosepak®. Now with a new and improved design, Dosepak Express® is our adherence-enhancing, paperboard package. Just like our original Dosepak, Dosepak Express is designed to provide a substantial area for dosing instructions and patient information while enabling a straight-forward calendarised blister for dosing therapy. The new and improved design increases sustainability by using less paperboard and reducing waste (savings significant, but vary depending upon package size), while maintaining the space for direct to patient communications and child resistance for the American market. The process improvements achieved with the new design also enable a lower cost with the same top quality features. The Dosepak Express has received the US Arthritis Foundation commendation for ease of use. Keystone Folding Box Co., a manufacturer of paperboard packaging solutions, has introduced Ecoslide-RX, a child-resistant (f=1), senior-friendly compliance package that is the most eco-friendly of its kind on the market. Ecoslide-RX is made from 100% recyclable material, contains no plastic in its secondary packaging and, unlike other paperboard compliance packs, requires minimal film and foil while maintaining an F=1 Child Resistant rating – the highest possible. Ecoslide-RX enters the market as a solution for prescription products, physician’s samples and clinical trial materials that meets and exceeds sustainability objectives adopted by an increasing number of organizations. 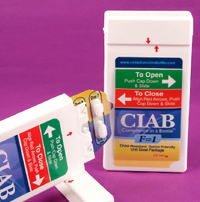 Unique dispensing action – Key-Pak’s unique “zipper” design on the back side of the card allows for clean and simple removal of the rear blister card panel and provides damage-free dispensing of the product. Ease of assembly – Unlike complex packages, Key-Pak is comprised of a single component, which means that fewer specifications, inspections, assembly, graphics, engineering and tooling are needed. Flexibility -The package is compatible with both thermoformed and cold formed blisters and the custom heat seal board allows for shorter sealing time, fewer production defects and minimal exposure of the product to heat. Keystone Folding Box Company, manufacturer of Key-Pak®, a child-resistant, senior-friendly Blister Card, has extended its line to offer Key-Pak Plus™. This new package features a Child-Resistant blister card contained within an integrated outer carton and offers a cost-effective solution for clinical trial materials, compliance dosing, physician’s samples and prescription drug applications. More affordable than other re-closable blister packages currently on the market, the patented Key-Pak Plus incorporates a fold-over, heat-seal blister card neatly tucked into a durable, yet light-weight carton. The card is secured to the carton, keeping the two components together as single unit. Because of the expanded billboard space, Key-Pak Plus allows for additional branding opportunities and detailed dosing instructions. Valuable insights from in-depth research with consumers in both Europe and the US, inspired us to design a product fully satisfying patients’ needs – Med-Easy®, our latest innovation in blister-pack medication that is convenient, discrete and easy to use. With ample room for communication on the pack and blister, manufacturers can differentiate their brands, while informing patients about how to properly take their medication. The pack can be made from recycled materials, is simple to fulfill and can easily be separated for recycling after use. Since market introduction in 2004, Shellpak® has achieved significant commercial success with more than 250 million packages sold. Market experience has enabled MWV to access pharmacy claims data to PROVE the impact Shellpak has had on patient adherence. Patients taking their anti-hypertensive in a Shellpak had significantly more days on therapy than those using vials. Additionally, consumer research has demonstrated that patients find Shellpak protects their medication and helps them recognize missed doses or need for a refill. The howell•CR•III® is a cost-effective solution for transforming non-child-resistant blisters into custom senior-friendly, child-resistant compliance packages. The compact wallet-style is versatile and proven at the F=1 level. Custom versions of the howell•CR•III® utilizing Aclar®, PVC, and Cold-Form Blisters also have passed the Consumer Product Safety Commission’s CR protocol attaining F=1. Additional features such as patient education brochures, product information material, and mnemonic devices are easily incorporated to enhance patient experience and provide unique branding opportunities. 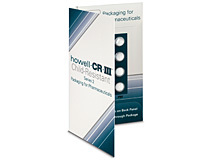 Applications for the howell•CR•III® include compliance trade packaging and patient starter and patient titration units. The howell•CR•III® is available on either virgin paperboard or on recycled paperboard.